These aircraft parts were recovered as a result of dredging. The pedal picturedÂ is engraved with the logo for the North American Aviation Company, an aircraft manufacturer focusing on the construction of small single-engined planes in the 1930s and which built more military aircraft between 1935 and 1967 than any other manufacturer in U.S. history. The presence of this logo suggests that the pedal comes from either the P-51 Mustang fighter or the B-25 Mitchell bomber, both manufactured for the U.S. air force by North American Aviation and used widely in Europe during the Second World War. 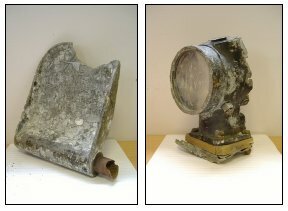 Photographs of the two parts have been examined at the RAF museum. The museum has surviving examples of both the P-51 and the B-25 and an aircraft technician at the museum was able to examine both planes to find matches for the parts. The pedal in the picture matched the rudder pedal on both planes! Unfortunately, a serial number identified on the lamp was no more helpful in identifying the plane. In fact, a match for the lamp could not be found on either aircraft. It is possible that the lamp may be unrelated or that it was an addition to the crashed aircraft in question and not standard equipment. This is a Wessex Archaeology project with funding from English Heritage.